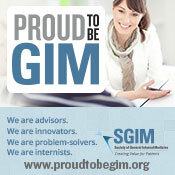 SGIM strives to advance and promote the field of academic general internal medicine. SGIM members conduct cutting edge research and teach medical students, residents, and fellows how to care for adult patients as internal medicine providers across the spectrum of care centers in both inpatient and outpatient settings. Regardless of your path in general internal medicine, SGIM provides the means to build and maintain a meaningful and fulfilling career. E-News: SGIM distributes a bimonthly electronic newsletter to all members, announcing Society news and other topics relevant to members. Learn more about SGIM dues and membership schedule here.